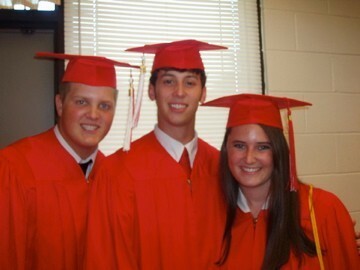 This post is dedicated to Blake Lynn (far left) and the Springwood class of 2006. For those of you who might be reading this and don’t know, I received the tragic news yesterday morning that one of my classmates from high school had passed away. Our graduating class was made up of only 34 people, and most of them I have known since I was 6 years old. Blake was one of those 34 people. I wasn’t close friends with Blake, but when you go to school with someone for 12 years, you easily get to know them. He was an integral part of our class and was always making us laugh. I can honestly say I have only positive things to say about him. He was kind-hearted and full of personality. My heart sunk when I found out, and I can’t help but keep thinking about all the memories I have of him throughout our 12 years at Springwood. Some of the first memories that come to mind when I think of Blake are all of the funny things he used to say, particularly in high school when I had two biology classes and an anatomy class with him. Some of you may know that I used to keep a running word document of all the ridiculous/silly things our classmates said. Approximately half of these are from Blake. Just going back through them right now, I was amazed at how many of our funny class moments were because of Blake. Carlin suggested I put these together and share them with you. I hope they bring back happy memories of Blake and the life he lived. If anyone else has any great stories or quotes from Blake to add, feel free to add on in the comments.